“Prevention is better than cure”. Discovering your risk factors and understanding your health condition will help to reduce the chance of getting heart disease. Early detection can also prevent certain heart diseases. Our centre provides various screening packages, please call us for more information or to make your appointment. The following is a detailed breakdown of the Basic Heart Screening package that we offer. *Inclusive of first specialist consultation. Strictly by appointment only. Only cash payment accepted for screening packages.Terms & conditions apply. Patient has known heart disease or other medical condition that may related to the heart, for eg. stroke. How long does an ECG take? This test is relatively simple and safe, the time needed for this test is usually about 5 minutes. What to prepare for the test? I have an ECG test done previously, why do I have to repeat the test? You can show your previous ECG to your doctor. There can be various reasons why the doctor requests for another ECG to be done, such as to assess for new symptoms that may be a result of heart disease. 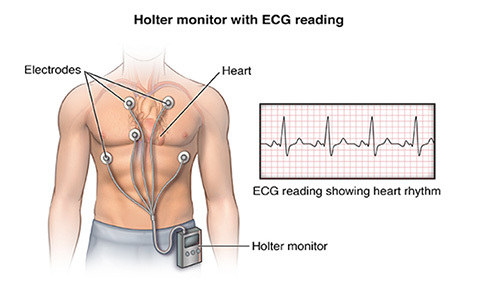 During the ambulatory electrocardiogram (ECG) (24-Hr Holter), the patient wears a recorder which will record his/her ECG continuously for approximately 24 hours. There will be 7 cables & electrodes that will be attached to the patient’s chest through the period of time. Unlike the usual 12 lead ECG, whereby the heart’s electrical signals are captured for only a few seconds, the continuous ambulatory ECG (holter) monitor can record continuously for a longer period as the patient continue with his/her normal daily activities or if the patient is warded, so that we can obtain a more extensive recording. The doctor then uses information captured on the holter monitoring to determine if you have a heart rhythm problem. The most common reason to do this test is to detect transient irregular heart beats that may not be detected uring the test when a resting ECG was done. It can also used to monitor the frequency of irregular heart beats and if they correlate to the patient’s symptoms. The test may be indicated for patients with symptoms such as irregular heartbeat, palpitations, giddiness, or fainting spells. Another reason for doing this test is to help monitor the patient’s ECG post electrophysiological procedures such as ablation, or if the patient has a heart condition that increases his/her risk of an abnormal heart rhythm. As the patient has to wear the monitoring device for approximately 24 hours, it is recommended that the patient takes a shower before he/she comes. Wear loose fitting clothing and no low neckline blouses. Do not apply lotion, oil or powder to the chest. Please note that some patients may develop some skin irritation after the test, due to prolonged wearing of the ECG electrodes. To reduce the chance of developing skin irritation, we use hypo-allergic micropore tapes to secure them to the patient’s body. However, do try to avoid touching or scratching the area, especially after the device is removed in order to prevent further skin irritation. For men, a small amount of hair on the chest may need to be shaved to make sure the electrodes adhere well to the body. The whole process to fix the monitoring device on the patient’s chest will take about 15-20 minutes. Instructions will be given on how the device works, and how to care for it. Once the device is fitted and monitoring started, the patient can leave the clinic and carry out usual activities. However the patient should not take a bath, swim or engage in activities that will damage/wet the device or cause the electrode to be disconnected. When to return the device? The patient has to come back to the clinic the following day. We will remove the device for the patient. The recording in the device will be downloaded; it takes an estimated 1-2 hours to analyse the data, afterwhich the patient can see the doctor for the review of the result. 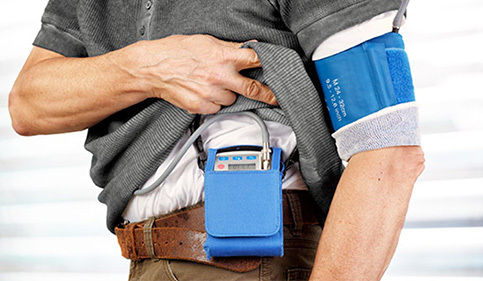 During the Ambulatory Blood Pressure Monitoring test (ABP), the patient wears the blood pressure cuff and the recorder for approximately 24 hours. The monitor will automatically pump the pressure cuff and measure the blood pressure during fixed intervals in the day and at night. This test is particularly useful for patients with high blood pressure as it helps us determine if the blood pressure medications are effective. It is also used to monitor borderline hypertension, young hypertension and poor blood pressure control. As the patient has to wear the monitoring device for approximately 24 hours, it is recommended that the patient takes a shower before he/she comes. Wear loose fitting clothing, try to avoid shirts with tight sleeves. Please note that occasionally, the blood pressure cuff may leave slight red marks on the arm, especially if the patient’s blood pressure is very high. These marks will go off on their own within 1 or 2 days, do not be alarmed. The patient has to come back to the clinic the following day. We will remove the device for the patient. 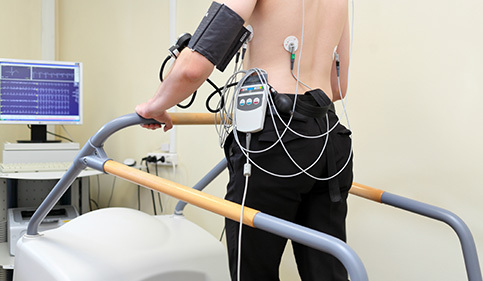 A treadmill exercise test, also known as stress ECG, is used to analyse how your heart reacts to exercise stress. A medical technologist will attach 10 wires to your chest and a blood pressure cuff to your arm for the purposes of monitoring you during the test. You will receive detailed instructions of the test before commencing. Usually, we will follow the ‘Bruce protocol’, in which there are a total of 7 stages. Each stage lasts 3 minutes, with an increment of slope and treadmill speed as you progress to the next stage. The first 3 stages are at walking speeds. It is not a requirement to finish all 7 stages. An average person usually completes 3-4 stages. When possible, we aim to achieve a target heart rate of 85% of the maximum predicted heart rage of the patient (Max pred. HR =220-age), to ensure that there has been adequate stress from the test. Throughout the exercise the medical technologist will monitor the changes in ECG readings and blood pressure. After the exercise, you will be monitored up to 5 minutes for recovery. One of the most common use of this test is for the diagnosis of significant coronary artery disease (heart artery blockages). Patients with this condition usually have symptoms such as chest pain or shortness of breath, which worsens with increased activity. • Check the effectiveness of procedures done to improve coronary artery circulation in patients with coronary artery disease, such as patients after CABG (Coronary artery bypass graft surgery) or post percutaneous coronary interventions (artery blockage ballooning or stenting). Before the test, the medical technologist has to take some time to prepare the patient for the test. We may use a rough abrasive paper to clean off some dead skin cells for better contact so that the ECG tracing is better. The exercise lasts for about 15 minutes, depending on each individual’s exercise capacity. After that, we will monitor for up to 5 minutes for the patient to recover. In all, please set aside approximately 30 minutes for the test. Please bring along your sports attire (running shoes and shorts) for the test. You may have some food (if you have not been asked to fast), but not too heavy so as to prevent vomiting. If you are on regular medications, please check with your doctor if you are supposed to stop them before the test. If you have asthma, or require the use of an inhaler, please inform the doctor and medical technologist before the test begins. Please bring your inhaler along with you to the test. During the exercise stress test, do inform the medical technologist if you start to develop symptoms such as chest pain, dizziness or breathlessness. 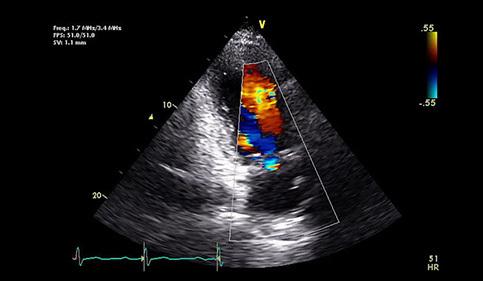 An echocardiogram, also known as “cardiac echo”, “cardiac ultrasound” or “transthoracic echo (TTE)”, is a non-invasive ultrasound scan of the heart. It has minimal to no side-effects as it uses ultrasound to visualise the heart. This is the same technology as that used to assess foetuses in the pregnant women. From the echocardiogram, we are able to see the internal structures of the heart and assess how the heart is functioning. During the test, the cardiac sonographer will ask you to remove your top and change into a gown (ladies). You will be required to lie with your body turned 90 degrees to your left, with your left arm tugged behind your head. This is the best position to obtain optimal images of the heart. The cardiac sonographer will use an ultrasound probe, with some aqueous gel, to scan the heart from different angles. Occasionally, the sonographer may ask you to regulate your breathing or hold your breath, as the lungs may obscure the heart. ; by regulating the breath, we can obtain better images. 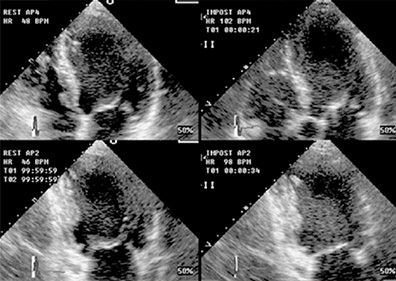 An echocardiography is often used to identify structural and functional abnormalities of the heart. The doctor may request you to do this test to look out for any possible heart valve or heart muscle diseases, changes in the heart chamber size, and how strong the heart is pumping. This will allow the doctor to understand and diagnose the heart condition that may have caused your symptoms. An uncomplicated scan takes about 30 minutes. A more complex scan may take up to 1 hour. This may be affected by the patient’s body habitus or the complexity of the underlying heart condition. Can we see if there are any blockages? We cannot visualise the coronary arteries (arteries that supply oxygenated blood to heart) using this scan. Therefore we will not be able to see if there are any blockages. However, we may be able to detect signs that may indicate underlying significant blockages. These signs include a weak heart function, scarring of heart muscle or segments of heart muscle may not move normally. No specific preparation for this test is required. However, do note that, sometimes, the cardiac sonographer may have to apply pressure using the ultrasound probe onto the chest, so as to see the heart clearer. This may cause some temporary discomfort or light pain to the chest. Treadmill stress echocardiography is a procedure that determines how well your heart and blood vessels are working. It is also called echocardiography stress test or exercise stress echo. It is a diagnostic procedure combining echocardiography (ultrasound study of the heart) and treadmill exercise test necessary. Your doctor may order a stress echocardiography test if you have chest pain which they might think is due to coronary heart disease. This test can also tell your doctor how well treatment such as bypass grafting, angioplasty, ablation and anti-arrhythmic or anti-anginal medications are working. What happens during a Treadmill Stress Echocardiography? You will be asked to change and lie on your left side (scanning position). 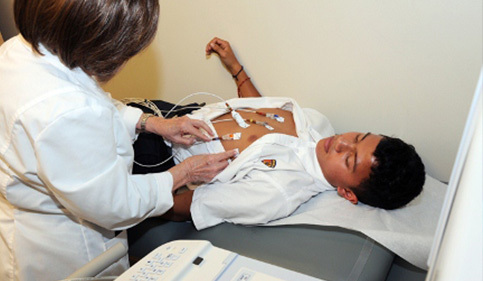 A baseline resting echocardiogram will be performed. A special gel will be applied and a ultrasound probeansducer will be placed over your chest to obtain the images of your heart muscles. Next, you will be asked to exercise on a treadmill machine. Your blood pressure and heart rhythm will be monitored during the test. The blood pressure and heart rhythm.The test will start off at a walking pace. The speed and inclination of the slope will increase every 3 minutes to progressively stress your heart. As the heart rate reaches its target heart rate, or if you are unable to continue due to fatigue or occurrence ofed symptoms to stop, you will be required to quickly return to the examination couch, and lie on to lie back on the couch on your left side (scanning position) immediately. The cardiac sonographer will then perform another ultrasound study to take more images with your heart beating at is peak rate. These images will be obtained within one to two minutes. You will be monitored for a period for aboutfurther 5 minutes as you recover from the exercise. Exercise will then be compared by both the doctor and the cardiac sonographer. 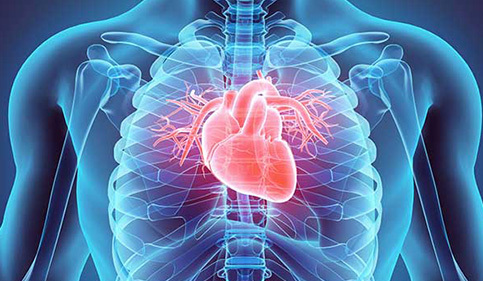 The information obtained will help the doctor to indirectly assess the status of the blood supply to the heart and function of the heart muscles. ures to be taken for youAn abnormal test result may warrant further tests to be performed. The whole procedure takes about with about 20-30 minutes of scanning and 9-12 minutes of treadmill exercise test. Before the test, the medical technologist has to take some time to prepare the patient for the test. We may use a rough abrasive paper to clean off some dead skin cells for better contact so that the ECG tracing is better. The entire test will take approximately one hour. ly m concern the medications as some medication has an effect to the heart rate.Please bring along your sports attire (running shoes and shorts) for the test. How is this test different from a Treadmill Exercise Stress test? A Treadmill Stress Echocardiogram may be ordered if your doctor requires an evaluation of the cardiac structures at the same time. It might also be necessary if you have an abnormal ECG at rest. A Treadmill Stress Echocardiogram is able to diagnose coronary artery disease with a higher degree of accuracy than a Treadmill Exercise Stress test. This is because the heart can be directly visualized at the end of the exercise stress. Treadmill Stress Echocardiogram requires specialized equipment and trained personnel, hence is less readily available.